The flag of the Cook Islands, which has been used since 1979, is composed of a dark blue leaf, Union Jack in the upper left part and fifteen white five-pointed stars arranged to the circle. 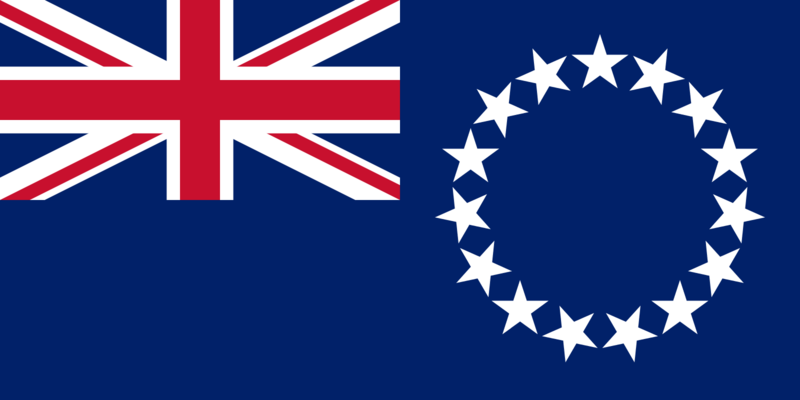 Union Jack refers to the times of British protectorate, nowdays, Cook islands are loosely associated territory of New Zealand. Fifteen equally large stars represent the main islands of the archipelago and their equal status. White and blue are the colors of the Democratic Party, which has been in power since 1979. Officially, blue denotes Pacific Ocean and white stands for the peaceful nature of local population. Before 1979, green-yellow flag that reflected colors of the former ruling part was used.